The statue isn't even a likeness of John Harvard, because there were no photographs or portraits available of the actual John Harvard. 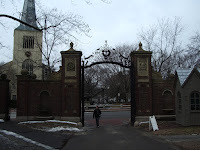 My other favourite piece of folklore was that students don't walk through Johnson gate because there is a superstition you won't graduate if you pass through the gate during your time at Harvard. It was funny to watch everyone squeezing in and out of the much smaller curse-free gate beside it. We managed to catch a student destroying their career in the photo! Does anyone else find it slightly amusing/annoying that Harvard is in a locality called Cambridge? Maybe it's just me.